In 1991, Hayao Nakayama, the chairman of Sega Corporation decided that in order to push his new Sega Genesis game playing system, the company needed to develop a company mascot, much like the Walt Disney Corporation had in Mickey Mouse and rival Nintendo had in Super Mario. Nakayama selected a design by Naoto Oshimo – a hedgehog with an attitude. Named Sonic, the hedgehog exuded enormous energy and charisma, able to roll into a ball and speed around the screen grabbing coins and other special prizes. The speed and frenetic pace of the character allowed Sega to show off their new state of the art technology that served as the centerpiece of the Genesis system. This technology allowed for faster screen scrolling and greater action and excitement. The new Genesis units shipped with a bundled copy of “Sonic the Hedgehog” and the popularity of the game system went through the roof. Eventually, the Sega Genesis became the top selling gaming platform in the world. In addition to the significant boost from the game unit technology, part of the reason for the success and popularity behind the game was the character himself. 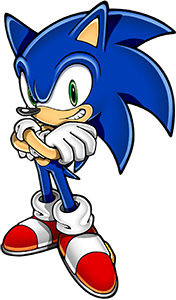 Sonic possessed an intriguing personality, full of attitude and confidence while at times displaying impatience and annoyance when the game-player was not performing well. The Blue-hued character, outfitted with red sneakers, would eventually take on the villain of the game, the evil D. Robotnik. In sequels tot he original game, Sonic would also gain a sidekick named Tails who often struggled to keep up with Sonic. Tails would find himself so far behind that he often had to spin his tail so fast that he could take flight and chase after his friend. The popularity of the game presented Sega with an enormous opportunity to market the Sonic character in other venues. Soon, Sonic could be seen on lunchboxes, bookbags and T-shirts. They followed by developing a comic book and then a cartoon show. Eventually, Nintendo and Sony developed better game systems and Sega Genesis sales dwindled. In order to compete, Sega began pushing new game systems and the emphasis on the Sonic character diminished. As such, the Sonic hysteria finally died out.